Silfield tower mill was built as a 5 storey tarred brick mill on the south side of Burnthouse Lane at the bottom of a short loke. 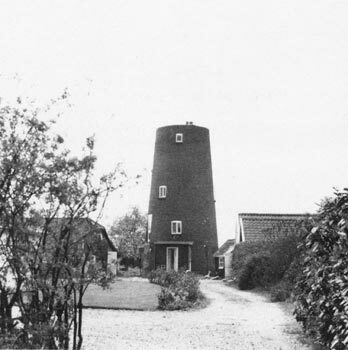 The mill was quite small with the tower standing some 36 feet high. The sails powered two pairs of underdriven stones. Rare opportunity. Modernised, extended House in excellent garden, outbuildings including stables and garaging, old mill tower. PROPOSED WORKS TO LISTED BUILDINGS AND DEVELOPMENTS IN CONSERVATION AREAS. NOTICE IS HEREBY GIVEN that the following applications have been made to the Council for planning permission. Convert derelict tower into residence. Tower treated with black resin based protective - Bellecoat Stipple - as at Wicklewood. Roofed with flat boards and tarred felt, with access from dust floor. Porch to front door and extension built on to rear where a door replaces a window. Spiral iron staircase - reproduction - to 1st, 2nd & 3rd floors. Central heating by solid fuel stove on ground floor; separate anthracite stove on 1st floor. Chimney on south side. Ground floor:- ceiling beam - not taking any weight - replaced turned on its side. To be treated.